Assignment completion is a big deal at the middle school level. 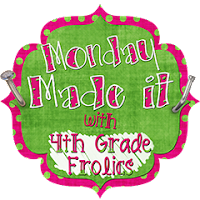 When my fifth grade was at the intermediate school, we were able to have a weekly time at the end of Friday to reward all fifth graders who were caught up on work. Everyone would gather in the gym to play dodgeball while those who weren't caught up had to stay in the room and finish. It was highly motivating. Unfortunately, we don't have the same opportunity at the middle school. Scheduling just didn't allow it this year. And the students started to not care if their work was in or not. So I had a brilliant (I think) idea! 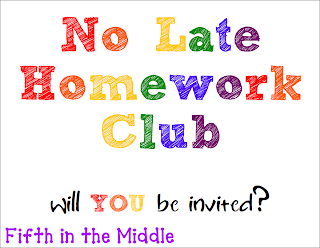 The No Late Homework Club. 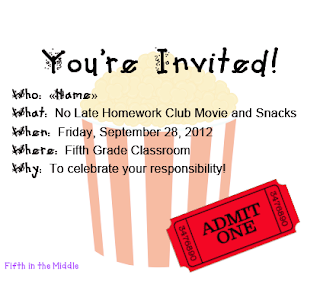 We gave students a fresh start and told them that if they had no late homework for the rest of September, they would be invited to the end-of-month movie and snack party. Things started to turn around! We ended up having half of the students qualify! The tailgate idea is fantastic! How motivating! The teachers are really excited for that one, too! The plans are getting more elaborate every day! What a wonderful idea! My partner and I were just talking about how we're struggling with keeping kids accountable and motivating them to turn in their homework on time - this is a perfect idea we plan to implement! Sure thing! Just the main sign, or the invite template and locker sign, too? Oh, I like this idea!! Perfect for those students that tend to not turn in their homework... what a way to boost them to want to! Can you email me these printables!! I am implementing them with our fifth graders in our school!! Great Idea!! Do you have these printable available on TPT? I'm excited to implement this. It seems easy to manage, yet motivating!! Thank you for your time!